A couple days ago I was reading on of my very favorite so-called "mommy-bloggers" blog's Enjoying the Small Things and in a recent post she showed a craft she had done with her little girl and I thought immediately that was something I wanted to do with Abby. 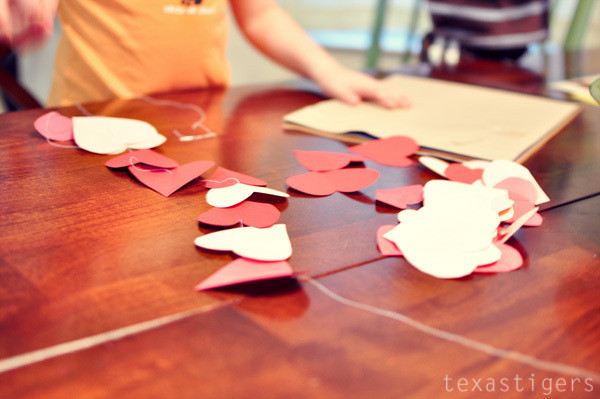 I started by cutting out some hearts in shades of red and pink. Then I got out the little sewing kit and threaded and needle and started by showing Abby how to "sew" through the paper hearts. For the first string I gave her a pattern to follow - red, pink, red, pink.... Her teacher has them sit in certain patterns at their table so I knew she would love having a pattern to follow. Then the next one I asked Abby to pick the pattern and she came up with pink, pink, red, red all on her own! The final long one I gave her free reign to use the rest of the hearts as she pleased. 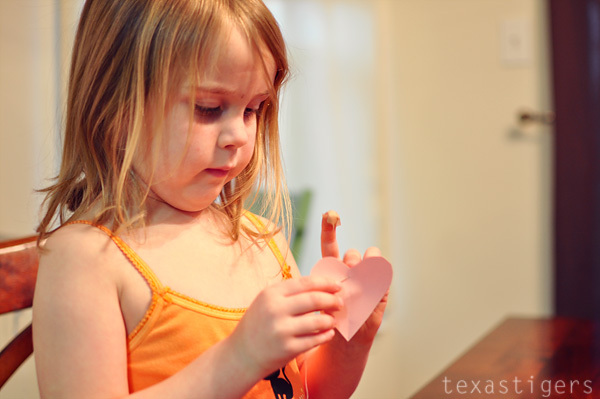 This was such a fun craft and simple craft to do but with lots of learning potential to talk about patterns and works on fine motor skills with the sewing of the hearts. Abby was so excited about the final project that it is now hanging in her room! tissue paper/ribbon - anything to wrap the hanger to make it pretty. We used tissue paper because I didn't have any ribbon handy but I might go back and redo it with ribbon to make it look a little prettier. Nice hearts! I can't draw them very well, they end up lopsided or weird, even if I take advantage of symmetry and fold the paper in half. Art is NOT my strong suit. oh how fun...we may have to do that too...thanks for sharing. Dude we are totally channeling each other! 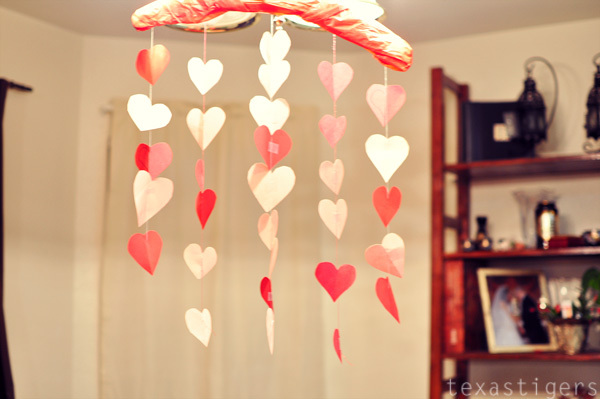 We did a heart mobile the other day too! :) Love yours!